Pharaoh Jackson Chesney, b. 1781? and J. C. Webster (John Coram), b. 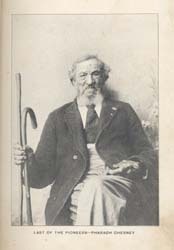 1861 Last of the Pioneers: Or, Old Times in East Tenn., Being the Life and Reminiscences of Pharaoh Jackson Chesney (Aged 120 Years). Last of the Pioneers: Or, Old Times in East Tenn., Being the Life and Reminiscences of Pharaoh Jackson Chesney (Aged 120 Years). Knoxville, Tenn.: S. B. Newman & Co., Printers & Book Binders, 1902. Chesney, Pharaoh Jackson, b. 1781? Freedmen -- Tennessee -- Biography. Frontier and pioneer life -- Tennessee. Plantation life -- Tennessee -- History -- 18th century. Slaves -- Tennessee -- Biography. Slaves -- Virginia -- Biography. Funding from the National Endowment for the Humanities supported the electronic publication of this title. Linda Brown and Sydney Brown provided the text for the electronic publication of this title.